Neurobehavioral Disorders and Epigenetics is a comprehensive reference for the epigenetic basis of most common neurobehavioral disorders. The volume is organized into 22 chapters representing individual neurological disorders, from Addiction to Stress. The epigenetic aspects of each disorder are addressed by at least two scientists with expertise in that research area. Particular emphasis is placed by each contributing author on potential epigenetic interventions. In an effort to cover a broad range of epigenetic mechanisms including DNA modification, histone post-translational modification, chromatin organization and non-coding RNA, author contributions were selected accordingly. In addition the effects of environmental stimuli on epigenetic states is addressed in some chapters based on relevance to disease induction. Recent discoveries in epigenetic research enabled by advances in genomic technologies, have positioned the field for broad translation to therapeutic interventions for previously unmanageable disorders. Clearly neurobehavioral disorders represent a prime target of epigenetic interventions as they are highly debilitating, often chronic diseases with high costs to society. 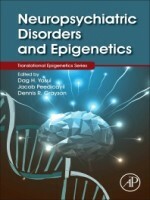 Thus, these collected works will define epigenetics as a key player in neurobehavioral disorders, highlight the full spectrum of epigenetic mechanisms underlying such disorders and introduce the vast range of epigenetic therapies under development.